People are starving, biogenetic adaptations are prevalent amongst the privileged, and the poor are being ground to a sharp and dangerous point. This is the future US where in the struggle for survival citizens are pushed to the breaking point as relationships start to fracture along the lines of class and race. These are stories of the leaders and the followers, the victims, heroes, and the everyday people caught in history's wake, chief among them Dr. Ezekiel Carter, a genius in his field who decides to offer genetic reparations to those being left behind. In this world, what will become of the people at the fringes and more than that of humanity itself? 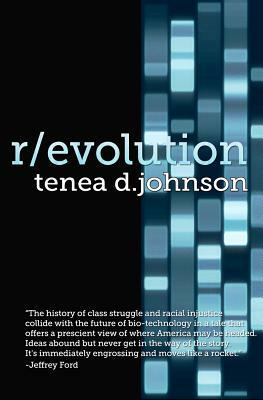 Tenea D. Johnson is an award-winning author, musician and editor. Her work includes the poetry/prose collection, Starting Friction, as well as the novels, R/evolution and Smoketown, of which Publisher's Weekly wrote "the understated, lyrical prose makes even small moments feel triumphant." Smoketown won the Carl Brandon Parallax Award, while R/evolution received an honorable mention the same year. Her short fiction and poetry have appeared in various magazines and anthologies, including Mothership: Tales from Afrofuturism and Beyond, Shades of Blue & Gray: Ghosts of the Civil War, and Tangle. She's performed her musical pieces at the Knitting Factory and the Public Theater, among other venues. Currently, she's working on the next book in the R/evolution series and a fiction album, Heroics. For more information please visit teneadjohnson.com.